The birth of Lord Krishna, Janmashtami has a special place in the hearts of Indians. The festival Dahi Handi is celebrated with a competition of breaking the butter-filled pots tied at a great height. Dahi Handi is one of Bollywood’s favourite festival too. There are so many films which capture the popular Dahi Handi moments and songs. To gear up your festive mood, take a look at the stars who celebrated Dahi Handi on screen. 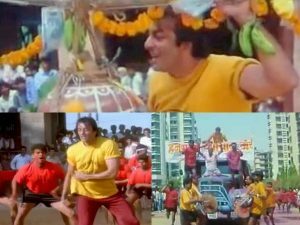 Superstar Bachchan Sr’s Dahi Handi song from Khud-Daar film is quite popular among the masses, Mach Gaya Shor is sung by iconic singer Kishore Kumar is picturised on Bollywood’s then angry young man showing off his peculiar dance moves. Big B breaks the butter filled handi with his head. Sanjay Dutt’s critically acclaimed 1999 gangster flick, Vaastav, has an amazing Dahi handi song. In the song Har Taraf hai yeh shor, we see Sanjay celebrating the festival with his On-screen family and friends. Dancing on this song is really energetic. Yes, of course, he breaks the handi too! Salman Khan represent the spirit of Janmashtami when he sang the song ‘Chandi Ke Daal Pe Sone Ka Mor’ in ‘Hello Brother’. In this scene, Salman teases Rani Mukerji. The actor is fails to break the pot at first, but later he breaks it successfully. Salman woos his lady love with this victory. In every Janmashtami, this song is mandatory on loudspeakers. Sonakshi Sinha made a special appearance in Akshay Kumar and Paresh Rawal starrer ‘Oh! My God’. She was seen dancing on the groovy beats along with Prabhudeva. In this song, Prabhudeva insists her to break the Handi, and Sonakshi climbs the women pyramid and gives a salute and at the end, she breaks the pot. 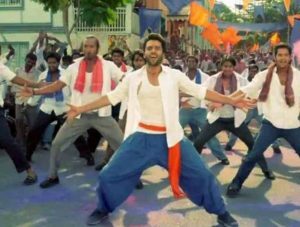 Jackky Bhagnani‘s action drama ‘Rangrezz’ gave us some major Govinda dance goals. Jackky played the role of a middle-class Maharashtrian boy who lives in Lalbaug. The actor climbs over the human pyramid at the end and does the honour of breaking the Handi. This was thrilled for a lot of fans. 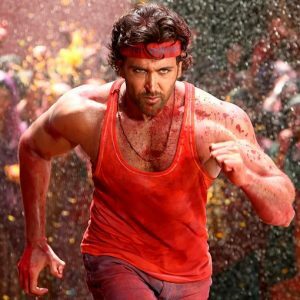 The dramatic Govinda sequence in ‘Agneepath’ marks the entry of Hrithik Roshan and Priyanka Chopra in this movie. The sequence displays a scene where people are celebrating Janmashtami festival by throwing gulal at each other and dancing on the beats of dhol and Lezim. Hrithik jumps to climb the pyramid and successfully breaks the pot. It’s amazing to see him doing this. Previous articleजन्मास्टमी के दिन इम्तियाज़ अली ने की घोषणा अब राधा कृष्णा की प्रेम लीला पर बनाएंगे फिल्म !